Get the look and feel of 350-year old reclaimed wood on your walls without the wait! Our patented Thermo-Treatment Technology speeds up the aging process and eliminates moisture, resins and bacteria from all the wood we use for wall decor planks and panels. 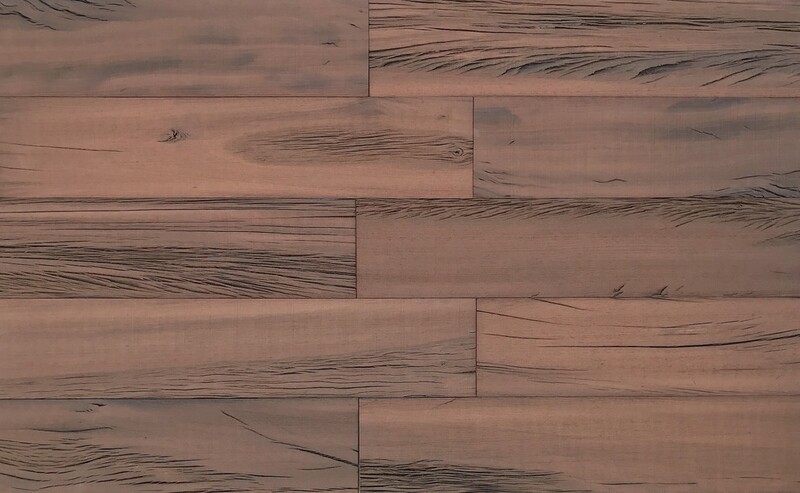 Our treatment turns the wood a natural golden brown color and makes our wall planks dimensionally stable and durable; no twisting, cupping or warping on the wall. Each plank is deeply wire brushed to achieve a 3D wood paneling texture that shows a variety of lights and shadows. Peel, stick and enjoy the rustic look of old world charm and modern luxury anywhere in your home! Our home decor wall planks are great for accent walls, wainscoting, wall tiles, ceilings, wall art, headboards, beadboard, under bars, trim for furniture and doors, and many other applications. In each box we include No Tools DIY Smart Installation Kit, including pre-cut starter/end planks, which makes installation possible in minutes. Smart Paneling is offered in a variety of beautiful designs; transforming any surface into a focal point in your home. Holey Wood wall planks and panels made from deeply, naturally cracked, wire brushed thermo-treated hardwoods to create the deepest 3D structure of reclaimed wood paneling on the market. Holey Wood walls add character, warmth and a rustic feel to any residential or commercial decor. W 4" / D 23.75" / H 0.25" / 8 lb.